HIS NAME IS ENZO AMORE. HE'S A CERTIFIED G AND A BONAFIDE STUD...AND YOU CAN'T TEACH THAT! Sorry, I had to get that out of my system. NXT opens with a semi-final match in the Tag Team Tournament and it's features Enzo Amore and Colin Cassady going up against The Vaudevillains. So, those are far and away my two favorite teams in the tournament, making this a bit disheartening. It was shorter than I expected and The Vaudevillains were able to pick up a clean victory. After the match, the Legionaries arrived and attacked Enzo before shaving half of his beard! That's something you just don't do to a man's beard. 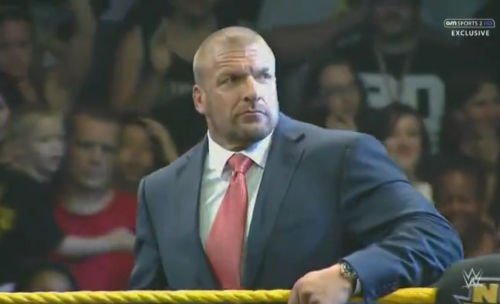 Next, Triple H came out to make a huge announcement to the NXT Universe. He informed everyone that the third NXT Special will air on the WWE Network on September 11th! I'm not a fan of it being called NXT TakeOver again but whatever. Triple H says that the NXT Championship will be defended along with the Women's Championship and the winners of the Tag Team Tournament will face the Ascension on that night too. Should be a good time and the last two Specials were outstanding. His last announcement is that there will be a new General Manager for NXT and he will be there next week. Excited for that for sure. I do want to make a side note that I absolutely love the fact that Triple H treats NXT like his baby. Good sign for the future. Tyler Breeze is not happy that his NXT Championship match was interrupted by Tyson Kidd last week and he tells Devin Taylor about it. It looks like he'll be facing Kidd right now. Two heels huh? Interesting. The match does not go for long and Breeze escapes the Sharpshooter only to grab his phone and head up the ramp to be counted out. Kidd would put on Tyler's vest after the match and pose on the top turnbuckle in a funny little moment. The NXT Women's Champion makes her way to the ring next as Charlotte will be in non-title action before her upcoming title defense against Bayley. And she's facing the awesome Becky Lynch. Man, I love Becky Lynch so much. This was a good match. They met a few weeks ago and it was good, this was about on par with that and it was better than Charlotte's defense against Summer Rae. Again, Charlotte hasn't impressed me much since TakeOver, so I really hope to see Bayley take the belt from her. Anyway, Charlotte picked up the win here and it wasn't surprising. Enzo Amore and Colin Cassady come out again after the commercial and Enzo is pissed. He tells Sylvester Lefort to fall back like his hairline. Ouch. Enzo issues a challenge to the Legionaires and he'll put his mohawk on the line against Lefort's hair at TakeOver. I assume it will be a tag team match. Mojo Rawley comes out next to bore me to tears and he wins a squash match over Steve Cutler. He then cuts a promo about how serious he is when it comes to Bull Dempsey. Oh god, they're going to wrestle at TakeOver most likely. Sheesh. Oh well, I only had one word in mind when Enzo made the hairline crack. The last match of the night would be the other semi-final match in the Tag Team Tournament. Sami Zayn and his disappointing partner Adam Rose faced Kalisto and Sin Cara. So, two guys in this match really impressed me and that was obviously Kalisto and Zayn. They had a spot where Kalisto wowed me. Don't get me wrong, Sin Cara works better in a tag team style and Rose is better in when he gets the chance to work on NXT, but still nothing special. He would get pinned by Kalisto and the finals of the Tournament are set to be Kalisto and Sin Cara against the Vaudevillains, which should be very fun.